Polly moved quickly across the flat rooftops, easily leaping across the gaps between buildings. She had an athletic build and had fallen into a long loping stride. She was of above average height but men always noticed her long well-toned legs that she loved to show off at every opportunity. She ignored the driving rain that fell in sheets, driven by the strong wind as she ran. Her long black hair had been tied into a ponytail to keep it out of her face as she ran. Her only real concession to the weather was a full length leather coat, but this was more to keep the various weapons secreted about her person dry than herself. She had just received a telephone call that a group of Slayers had been reported in the city and one of her brothers was unaccounted for. Out of all her brothers she hadn’t had to ask who it was that was missing; of course it had to be him. Of all the clan he had caused more trouble in his short existence than any other, a walking disaster with fangs. If there was trouble to be had then he would be found in the middle of it. Keeping the young vampires in line and safe had been difficult before but now he was around it was growing impossible. Coming to the end of the row of buildings, she paused. On the street below a police patrol car was parked, the occupants happy to stay dry inside the car this night. With a giant leap she landed on the roof some twenty feet away on the opposite side of the street, the police none the wiser for her passing. As she moved along the new line of flat roofs she picked up the faint scent of blood and she knew that she had guessed right on where her missing brother would be. Coming to the end of the buildings she knelt down and peered into the alley below. Her missing brother stood in the centre of the alley in one of his usual ridiculous outfits. For some reason he refused to just blend in. He always seemed to dress to be noticed; far too many sequins and thigh high leather high heels. For a vampire this was not a normal trait, as when you were hunting you didn’t want your prey to see you coming. Before her brother a body was sprawled on the floor, obviously dead and the source of the scent of blood. Ten other figures stood in a semi-circle before him all ready to spring forward and attack the lone vampire. They were armed with wooden stakes, crucifixes and other tools that slayers used to hunt down her kind. Standing up she shook her head. head. Trust him to find the slayers and then stand and face them rather than running. With a deep sigh she stepped forward and walked off the edge of the roof. Scrimshaw, Glenn (2012-02-11). 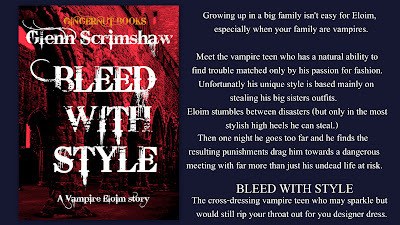 Bleed with Style (Kindle Locations 81-83). Gingernut Books Ltd. Kindle Edition. In recent times many of the vampires you meet in books have become safe, friendly high school misfits who drink blood from a glass rather than a cheerleader’s neck. 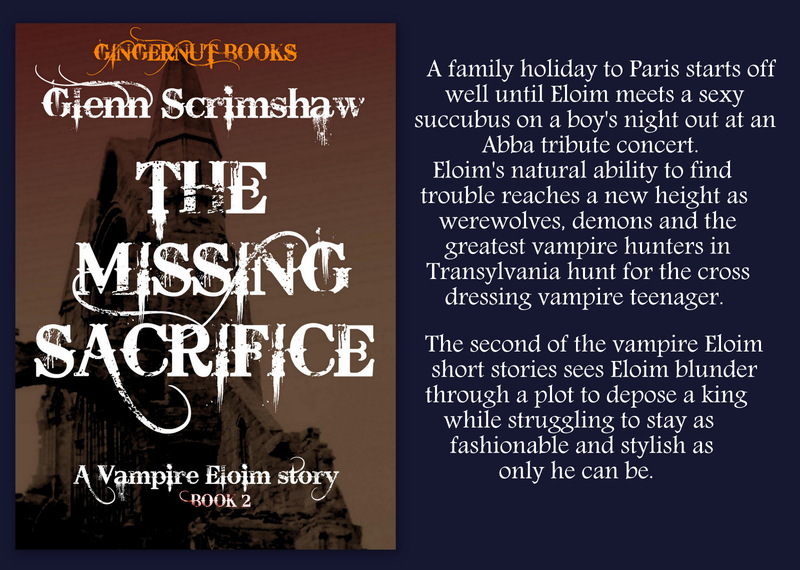 So here comes Eloim, a teenage vampire with a couple of oddities. Well firstly he kills people and if you sent him to school then he would see it as an all you could eat buffet. Secondly, Eloim loves fashion and expresses his passion by stealing and wearing his sister’s clothes. 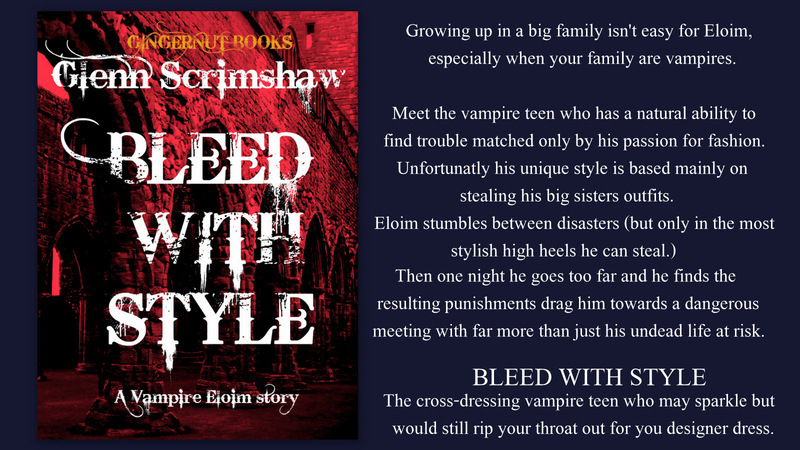 Life for the teenage vampire is tough, surrounded by a large family that are always watching him to try and keep him out of trouble, which is Eloim’s second favourite thing. He has a natural knack for finding it and even when he tries to be good it backfires. 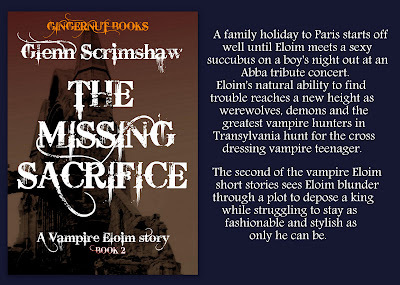 Not only does he have to survive the normal growing pains of a vampire discovering his powers but he also has to watch out for a Demon Empresses who makes him her number one target.